In this tutorial, you will find a simple explanation of the Excel DATEDIF function and a few formula examples that demonstrate how to compare dates and calculate the difference in days, weeks, months or years. Over the past few weeks, we investigated nearly every aspect of working with dates and times in Excel. If you have been following our blog series, you already know how to insert and format dates in your worksheets, how to calculate days, weeks, months and years as well as add and subtract dates. In this tutorial, we will focus on calculating date difference in Excel and you will learn different ways to count the number of days, weeks, months and years between two dates. As its name suggests, the DATEDIF function is purposed for calculating the difference between two dates. DATEDIF is one of very few undocumented functions in Excel, and because it is "hidden" you won't find it on the Formula tab, nor will you get any hint on which arguments to enter when you start typing the function's name in the formula bar. That is why it's important to know the complete syntax of Excel DATEDIF to be able to use it in your formulas. Start_date - the initial date of the period you want to calculate. End_date - the ending date of the period. Results of other functions. For instance, the following formula counts how many days there are between today's date and 20 May, 2015. Note. 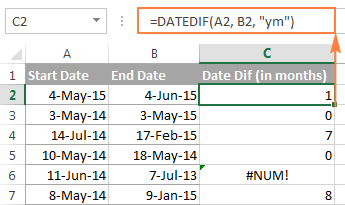 In your formulas, the end date must always be greater than the start date, otherwise the Excel DATEDIF function returns the #NUM! error. Unit - the time unit to use when calculating the difference between two dates. By supplying different units, you can get the DATEDIF function to return the date difference in days, months or years. Overall, 6 units are available, which are described in the following table. Y Years Number of complete years between the start and end dates. M Months Number of complete months between the dates. D Days Number of days between the start date and end date. MD Days excluding years and months The date difference in days, ignoring months and years. YD Days excluding years The date difference in days, ignoring years. YM Months excluding days and years The date difference in months, ignoring days and years. Hopefully, the above information has been helpful to understand the basics. 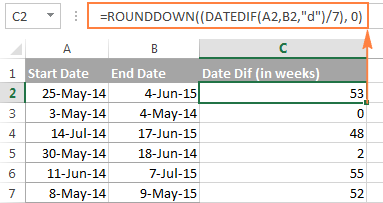 And now, let's see how you can use the Excel DATEDIF function to compare dates in your worksheets and return the difference. If you observed DATEDIF's arguments carefully, you've noticed that there exist 3 different units for counting days between the dates. Which one to use depends on exactly what your needs are. 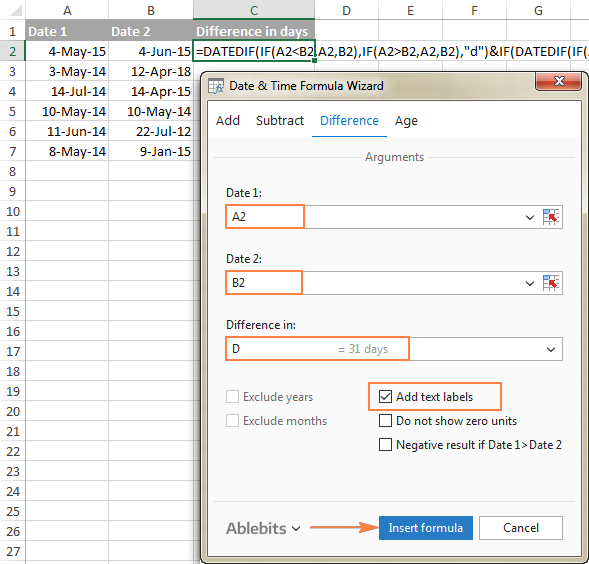 Please see How to subtract dates in Excel for full details and more formula examples. The screenshot below demonstrates the results, and comparing it with the screenshot above can help understand the difference better. Tip. To get the number of working days between two dates, use the NETWORKDAYS or NETWORKDAYS.INTL function. 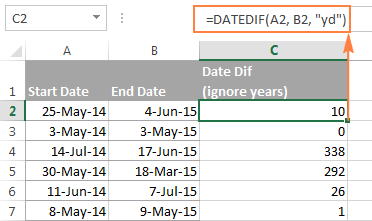 As you probably noticed, the Excel DATEDIF function does not have a special unit to calculate date difference in weeks. However, there is an easy workaround. To find out how many weeks there are between two dates, you can use the DATEDIF function with "D" unit to return the difference in days, and then divide the result by 7. Where A2 is the start date and B2 is the end date of the period you are calculating. 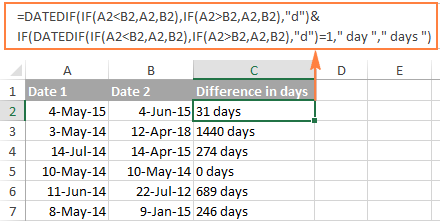 Similarly to counting days, the Excel DATEDIF function can compute the number of months between two dates that you specify. Depending on the unit you supply, the formula will produce different results. Note. 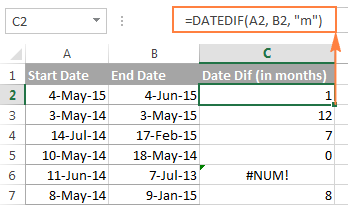 For the DATEDIF formula to calculate months correctly, the end date should always be greater than the start date; otherwise the formula returns the #NUM error. As you see, this formula also returns an error in row 6 where end date is less than the start date. If your data set may contain such dates, you will find the solution in the next examples. Notice that the YEAR/MONTH formula has no problem with calculating months in row 6 where the start date is more recent than the end date, the scenario in which an analogues DATEDIF formula fails. Note. The results returned by DATEDIF and YEAR/MONTH formulas are not always identical because they operate based on different principles. 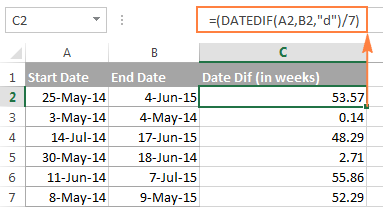 The Excel DATEDIF function returns the number of complete calendar months between the dates, while the YEAR/MONTH formula operates on months' numbers. For example, in row 7 in the screenshot above, the DATEDIF formula returns 0 because a complete calendar month between the dates has not elapsed yet, while YEAR/MONTH returns 1 because the dates belong to different months. Row 4: the end date is less than the start date and therefore DATEDIF returns an error while MONTH-MONTH yields a negative value. Row 6: the dates are of different months, but the actual date difference is just one day. DATEDIF returns 0 because it calculates whole months between 2 dates. MONTH-MONTH returns 1 because it subtracts the months' numbers from each other ignoring days and years. 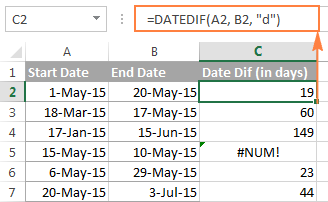 Notice that the DATEDIF formula returns 0 in row 6, although the dates are of different years. This is because the number of full calendar years between the start and end dates equals to zero. And I believe you are not surprised to see the #NUM! error in row 7 where the start date is more recent than the end date. The DATEDIF function calculates complete calendar years, while the YEAR formula simply subtracts one year from the other. Row 6 illustrates the difference. 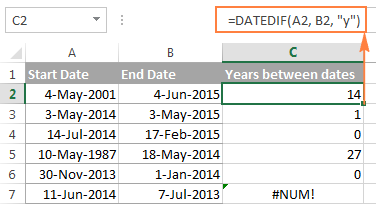 The DATEDIF formula returns an error if the start date is greater than the end date, while the YEAR function returns a negative value, as in row 7. =DATEDIF(A2, B2, "y") &" years, "&DATEDIF(A2, B2, "ym") &" months, " &DATEDIF(A2, B2, "md") &" days"
=IF(DATEDIF(A2,B2,"y")=0, "", DATEDIF(A2,B2,"y") & " years ") & IF(DATEDIF(A2,B2,"ym")=0,"", DATEDIF(A2,B2,"ym") & " months ") & IF(DATEDIF(A2, B2, "md")=0, "", DATEDIF(A2, B2, "md") & " days"
Where A2 is the birth date. To learn other methods of converting a birthdate to age, check out How to calculate age from date of birth. As demonstrated in the first part of this tutorial, Excel DATEDIF is quite a versatile function suitable for a variety of different uses. However, there is one significant drawback - it is undocumented by Microsoft, meaning, you won't find DATEDIF in the list of functions nor will you see any argument tooltips when you start typing a formula in a cell. To be able to use the DATEDIF function in your worksheets, you have to remember its syntax and enter all the arguments manually, which might be a time-consuming and error-prone way, especially for beginners. Select the cell where you want to insert the formula. Click in the Date 1 box (or click the Collapse Dialog button to the right of the box) and select a cell containing the first date. 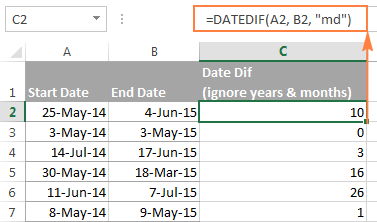 Click in the Date 2 box and select a cell with the second date. Select the desired unit or combination of units from the Difference in drop-down menu. As you do this, the wizard lets you preview the result in the box and the formula in the cell. If you are happy with the preview, click the Insert formula button, otherwise try different units. Exclude years and/or exclude months from calculations. Show or do not show text labels like days, months, weeks, and years. Show or do not show zero units. Return the results as negative values if Date 1 (start date) is greater than Date 2 (end date). Unlike a regular DATEDIF formula, an advanced formula created by the wizard does not care which of the two dates is smaller and which is larger. The difference is always calculated perfectly even if Date 1 (start date) is greater than Date 2 (end date). The wizard supports all possible units (days, weeks, months and years) and lets you choose from 11 different combinations of these units. 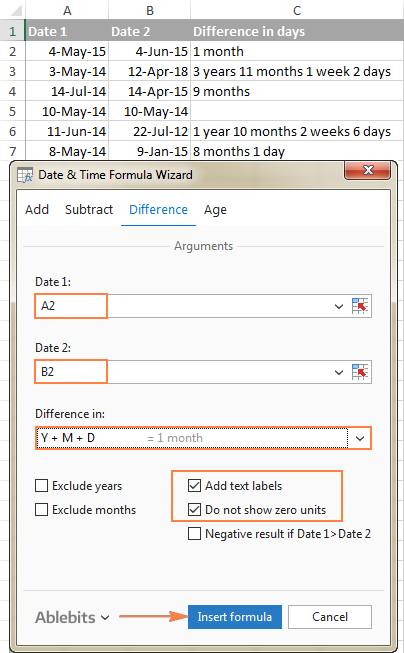 The formulas the wizard builds for you are normal Excel formulas, so you are free to edit, copy or move them as usual. You can also share your worksheets with other people, and all formulas will remain in place, even if someone does not have the Ultimate Suite in their Excel. If you are curious to try the Date & Time Wizard in your worksheets, you are welcome to download 14-day trial version. And if you like the tool and decide to get a license of the Ultimate Suite, be sure to grab the 15% off coupon code that we provide exclusively to our blog readers: AB14-BlogSpo. This is how you compute the difference between two dates in various time intervals. Hopefully, the DATEDIF function and other formulas you've learned today will prove useful in your work. Anyway, I thank you for reading and invite to check out other tutorials to working with days and time in Excel. 212 Responses to "Excel DATEDIF - calculate difference between two dates in days, weeks, months or years"
I have a problem to calculate my rental in different period and rate. How to converting the above in If formula in excel? How can I calculate together month and year in excel macro?. I need to create an elapsed days formula from a start date to today's date for submittals. When the submittal is returned I would like the formula to show elapsed days from the start date to the end date (received) and not today's date. Hi, I'm trying to find a formula calculating days that has passed since..
For instance, how many days have passed (aged) since date of entry. This will be updated based on an input calendar date. I'm trying to figure out, how to calculate no. days between two dates for a particular product which is repeating at different dates. I'm trying to calculate date difference is days, hours and minutes so there are 2 dates start and end date. Start Date (Date Value) and End Date (Blank or have formula). Any support would be greatly appreciated. Really, it is very help full because sometimes if we don't get in touch with these formulation, can be washed from brain. and as soon as the date cross the time of the start date, one day should be added, how to do it? how to find the difference in dates in months so that lets say employees joining before 15th of the month are considered to be working for 1 extra month and employees joining after 15th are not considered? Is it feasible? Hi I am trying to automatically get column names in excel basis start date and duration as input. For example if I fill start date as 1-Jan-16 and Duration as 3 years or 36months it should automatically populate columns like Jan-16, Feb-16, Mar-16 .......Dec-18. Great instructions! on negative dates code for between two dates! Best on the web. :) Thank you! Need a help. I want to calculate the no. of days between two dates by considering that only "sunday" is weekly off & rest 6 days are working. Take a look at this article here on AbleBits. I believe it will provide the answer you want. I would like to know some questions the following case.? I have start date and end date for some contracts. But, Contract start date aren't start when i open the day. So.. it is problem for me.Please tell me how to solve these formula? i hope you answer to me. Please try this one. In B2 start date & in c2 end date. I see you add the +1 in the formula. I was wondering about this. I have accounted for this in the past, but everything shows that the number of actual days is apparently one less. Example: 01-NOV-2017 and 30-NOV-2017, no matter what function you use, the answer comes up 29 days instead of 30. I usually add the +1 at the end of the formula, but it should come out the same. It seems like the functions do not take into account the first day as if you really didn't meant to count it. Dateif doesn't exist, but DateDif does :) However, DATEDIF in an undocumented function, which is why it does not appear in the list of formulas, so you will have to type a whole formula manually. I have needed a formulla, if a employee is joining date and leaving date would be >4 years and 6 months then he will get 50% bonus otherwise he will not eligible. =DATEDIF(‘Start Date’,’End Date’,M) will report the number of complete months between dates. That works 95% of the time but sometimes contracts cross leap years or they don’ start on the 1st day of the month or end on the last day of month. I know that it looks wordy but I store it in a most used functions worksheet so I can copy it into my worksheet. I have not found a bug is my most recent version of this function. I'm trying to do this in excel but it doesn't give me the option for DATEDIF, only DATE or DATEVALUE...so I'm not sure what to do. Do you guys have a different formula that I can use without that function? The datedif function no longer exists inf Office 2016. As usual, when the imbeciles at Microsoft "improve" a product, they remove useful functions. DATEDIF still works in Excel 2016. But it is undocumented, meaning you won't find it in the list of functions. To use DATEDIF in your formulas, you need to remember its syntax and type all the arguments manually. I am using the datedif function to calculate years of service for employment. I have that part down with the exception of employees that had a break in service. How do I add their previous years served before their break in service to their current years of service? How to I create a formula to add the current time in service along with the previous time in service? =DAYS("01/11/17 02:15:21"-"31/10/17 10:45:00",0)*24 + HOUR("01/11/17 02:15:21"-"31/10/17 10:45:00") & " hours " & MINUTE("01/11/17 02:15:21"-"31/10/17 10:45:00") & " minutes " & SECOND("01/11/17 02:15:21"-"31/10/17 10:45:00") & " seconds"
I am trying to display the date, that is x number of days after Jan 1.
to display how many days it has been since the start of the year. I am now trying to display the date 30 days prior. For instance, this equals 300. How do I display the 300th day of the year (i.e. October 27)? I want to do the same but count the number of months going forward from say Aug to May in that format... Any thoughts? I find the date functions flawed as they take an extra day away from the result. 01-NOV-2017 to 30-NOV-2017 should be 30 days, but every calculation I use shows 29. Why are the date functions missing a day? Hi, I got a problem in calculating for year month. I would like to add one month for every month. (I would like to auto add one month for the example. Please give me the formula). How to calculate difference in two dates in days when the date is selected/inserted from calendar through Microsoft Date and Time Picker Control. This formula is not working =DATEDIF(A2, B2, "d") because it is not considering cell to the cell where date is selected from picker. Hi there. Newbie to Excel, so no expert by any stretch. I'm trying to work out how to do a formula to count days within a month only. I have two columns titled "Start Date" and "Finish Date". For example. Start Date is 22 Jan 18 and Finish Date is 11 Feb 18. Is there a formula to count the number of days (within those two columns) for the month of January 2018 only? It would equal 9 days. I then need another formula, same example as above, to calculate the days that would be returned for February 2018 only, ie. would equal 10 days. The total amount of lines within the speadsheet could be anywhere up to 500 lines. I have found formulas to count the total days, but not exactly for a month only. Hope that makes sense. Thanks. Can someone help me to that I want to find the days in between my start date & today date. But the result is #NAME? if today is 18 Mar 2018, the result shows a month! hi there, can someone help me, i need help in column in where it would say "ready" if its within a year from today's date and the other will say "under construction" if its still over a year from today's date. I need to find the difference between two dates in weeks and days. Can you help me? How do I calculate the number of days between two dates in two columns? I issued this formula for date calculation DATEDIF($F5,TODAY(),"y")&" Years, " &DATEDIF($F5,TODAY(),"ym")&" Month,"&DATEDIF($F5,TODAY(),"md")&" Days"
You need to enter the date in a format your version of Excel recognizes as a date like 1/1/18 is January 1st 2018 in my version. So, if A47 holds the date 3-Apr-14 and D47 holds the date 1-Sep-18 this formula will return 230. Be sure to format the cells as dates. You can change the A47 and D47 to the cell addresses that suit you. I have no datedif function in Excel 2013, but instead have datediff function which is different. Is there a method that I can use datedif function in VBA Excel 2013? I have a list of dates for car payments occurring bi-weekly. My goal is to count any month that contains an instance of 3 dates. I have no idea how to make a formula for this. I've been Googling this for an hour and can't find an answer. There are three car payments in January. I need to create a countifs for recurring months exceeding two date entries. This is literally just one column with dates in it under a heading called "Car Payments." In a separate area, I need to use a function to show which months appear more than twice. Where the dates are in the range O11:O22 use this formula to count the number of times January 2019 appears in the list. You can enter, "Jan 2019 Car Payments" in an empty cell to the left or right of the cell that holds this formula. Then you'll see the number of time Jan 2019 appears in that range. By copying this formula and pasting it into another cell and changing the dates you can do the same thing for all the dates for which you're interested in getting a count. Note I've got the range in an absolute reference by using the dollar signs. If you want your range to extend beyond the 11 cells in that range change the $O$22 to a different address. Be mindful of how you copy and paste this formula because there should not be a break after the COUNTIFS function. I have to be able to calculate the total number of years, months, and days of experience for many employees. I have used the DATEDIF function to calculate the time elapsed between the dates for each individual job. However, I am trying to figure out a way of adding the resulting figures to come up with a comprehensive time calculation (ie. enter the start and end dates to come up with a calculation that the employee worked 1y, 2m, 28d at one job, and 3y, 5m, 7d at a second job, and then have a separate field that is able to tell me that the employee has a total of 4y, 8m, 5d of experience). Did you get an answer for this? I'm trying to do the same thing. KPI is 5 Days, so I need to work out from Column N if this was within 5 days, ie. what the % rate was. If 5 days or less, then response would be 100%. If less than 5 days, then display the % rate. I have a date i.e 22-Mar-1968 and I want to add in this date only 23 year. what will be the formula in excel. please guide me. I'm trying to track evaluations. I want the same month and day as their date of hire, but this year to be included. For example, date of hire: 2/14/1997, next eval: 2/14/2019. Is there a formula for this?